Photo of the day: THE BLOOM IS OFF THE ROSE, FAMED ROSELAND TO CLOSE – Another knife in the heart of New York’s theater district is the recently announced April 2014 closing of the iconic once dance hall, now concert and party venue Roseland. It is with head spinning disbelief that yet another historic piece of New York will be replaced with a tall mirror glass building according to insiders who currently work at Roseland and are being handed their pink slips. 2013 saw more (almost daily) closings and tear downs of long time establishments than in recent memory – all part of the mayor Bloomberg’s greedy search and destroy tactic of anything that is (not so) old, is just out of the reaches of being declared a landmark and therefore won’t face the trials of court injunctions against it’s demolition. Zoning law variances have become the norm and for a price history, building restrictions and the heart of the city mean absolutely nothing. The average price of buying a New York City council member (like mine, Jimmy Van Brammer) is $10,200 – buy a few council members and you can build what you wish, they will magically ‘vote’ your way. 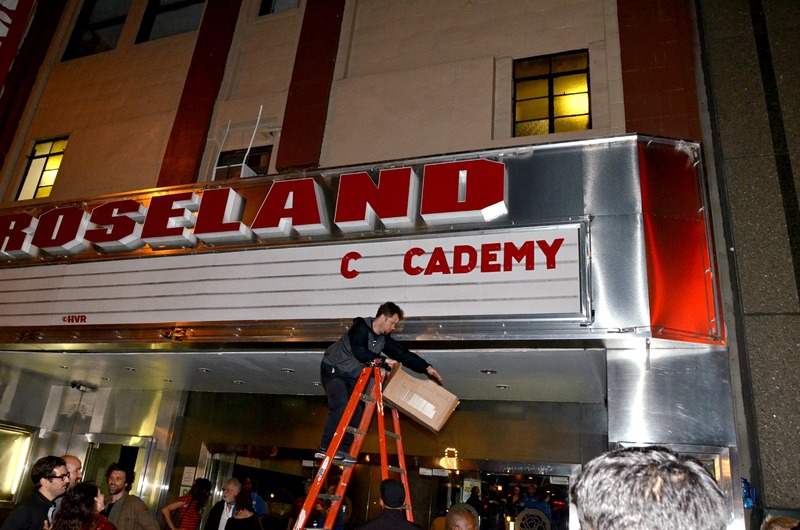 Roseland started on 51st Street as a 1919 dance hall for ‘refined dancing’, slowly that evolved to ‘dance hostesses’ who offered dances for 11¢ a dance (think “Sweet Charity”). From white ‘refined’ music it evolved into a swinging big band and jazz club featuring the likes of Louis Armstrong, Count Basie with his “Roseland Suffle”, Chick Webb and Ella Fitzgerald, Glenn Miller, Frank Sinatra to Madonna, Beonce and Donna Summer and all the other major music acts of our time. The original club closed and reopened in 1956 one block over on 52nd Street in a former ice rink. Slow dancing turned into disco nights and rock concerts. Infamous underground parties, fan shows, conventions, new and old music groups appeared here or made their reappearance here, for example disco diva Grace Jones in 1978 broke through a brick wall on her motorcycle and then did her act surrounded by tigers. She made her grande reappearance in 2012 and hadn’t changed a bit (see my old post). And now along with the Lenox Lounge in Harlem, Colony Records in Times Square, South Street Seaport’s Pier 17, and endless other victims of this genocide of history – you can add The Roseland Ballroom. Is this what it is like to grow old? You loose everything around you? Or is it the voracious greed of our destructive mayor, who in his twelve years of being mayor has gone from being the 18th richest man in America worth $18 billion, to becoming the 10th richest man in America now worth $31 billion . . . coincidence, it think not. This entry was posted on October 22, 2013 by newyorkcityinthewitofaneye. It was filed under DAILY PHOTOS WITH STORIES OF NEW YORK CITY and was tagged with 10 cents a dance, Bloomberg corrupt, buying a council member, Chick Webb and Ella Fitzgerald, Colony Records, corrupt city politics, CORRUPT POLITICIANS, Councilman Jimmy Van Brammer, Count Basie with his "Roseland Suffle", dance hall, dance hall hostesses, disco dance nights at Roseland, Ella Fitzgerald, Frank Sinatra, Glenn Miller, Grace Jones, greedy politicians, Hans Von Rittern, Jimmy Van Brammer, Lenox Lounge Harlem, Louis Armstrong, Manhattan, Mayor Michael Bloomberg, New York City, New York photo, Photo of the day, politicians can be bought, Queens, rezonning laws in New York, rock concerts Roseland, Roseland 1977 film, Roseland Ballroom, Roseland Ballroom closing, Roseland torn down, South Street Seaport, Times Square, zoning variances in New York.